went the dresses while I was maniacally making the skirts. and the dresses would never have seen the light of day. Till maybe winter when they'd have been defunct. def: a person who is skilled at being daft. But enough of me. On to the summer dresses. already has 459 other tasks to do. 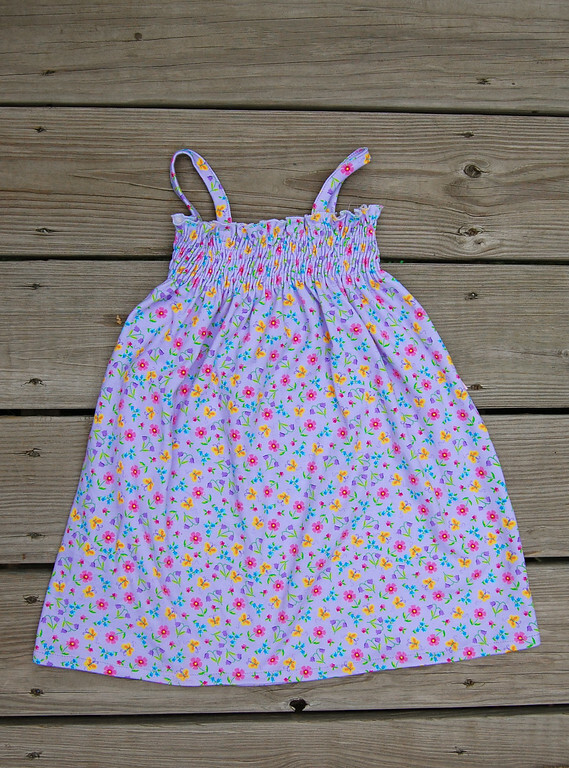 First up is the basic spaghetti-strap shirred-bodice sundress. to do it from scratch. So you use up actual stash fabric! 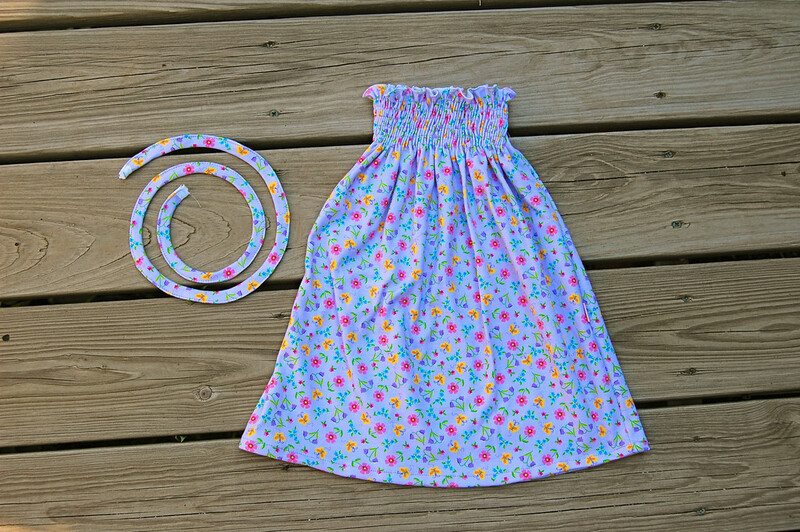 Generally, 3/4 - 1 yard of typical 44-45" width fabric is sufficient for a dress like this. Also elastic thread and regular sewing thread. Measure around the chest of your child. Multiply this by two and add 3-4 inches for good measure. Call this measurement X. Measure also the length of the dress you want, from the armpit to where you want the bottom hem to be. Call this Y. Cut out a piece of fabric of length X and width Y. Y should be parallel to the selvedge, especially if it is a knit or some other stretchy fabric. This is so the fabric stretches sideways when worn (i.e. along X) and not vertically. Vertical stretching makes for an uneven hemline over time. below that, after shirring. It "shrinks" a lot, doesn't it? For the actual shirring process (like how to get the elastic thread all stretchy), see my friend Jen's tutorial on her blog, for nice instructions and a pattern for making an adult shirred tube top. first finished the top edge with the serger on a rolled-hem setting. You can fold it over and top-stitch with a regular sewing machine instead. then sewed 6 rows of shirring 1/2" apart, beginning the first row 1/2" from the finished top edge. The rows of stitches were parallel to the finished top edge i.e. X. The entire shirred portion was about 3" wide, because I wanted this to be baby-doll-ish. You can add more rows of stitches if you want a longer shirred bodice. Remember to backstitch at the start and end of each row of shirring. This is what the front and back look like. Grab your child, wrap the dress around her to desired snugness and to determine the final width. Do NOT cut away the excess fabric yet! I beg you - for the love of all things sacred! Sew the side seam with a regular sewing machine, with right sides of the fabric facing each other. Reinforce the seam with the shirred portion with more stitches, preferably of different stitch length to be sure to catch all the elastic thread. Then serge or cut-and-zig-zag the seam allowance. Doing this before sewing the seam with a regular sewing machine is disastrous (guess what I did) and will unshir all your shirring and leave you devastated and dangerous around sharp objects. Sniff. But anyway, anyone notice that the dress looks like a dress already? Make straps - either with ribbon, bias tape (sewn shut) or make your own with the same fabric as the dress. The spiral in the picture is the strap(s) before I cut it into half for each shoulder. This strap was sewn like double-fold bias tape, except it was not cut on the bias because the knit fabric already had some stretch. If you have a serger, you could cut a long strip of 1" wide knit fabric and do a stretch rolled-hem (so it ruffles) on both edges. This makes pretty wavy-edged shoulder straps. Fold in about 1/4" of the the raw end of the strap and sew the end of the strap to the wrong side of the fabric, just above the first line of shirring. Again, I had the wearer model the dress and marked out where I wanted the straps to be, and how long to cut them. 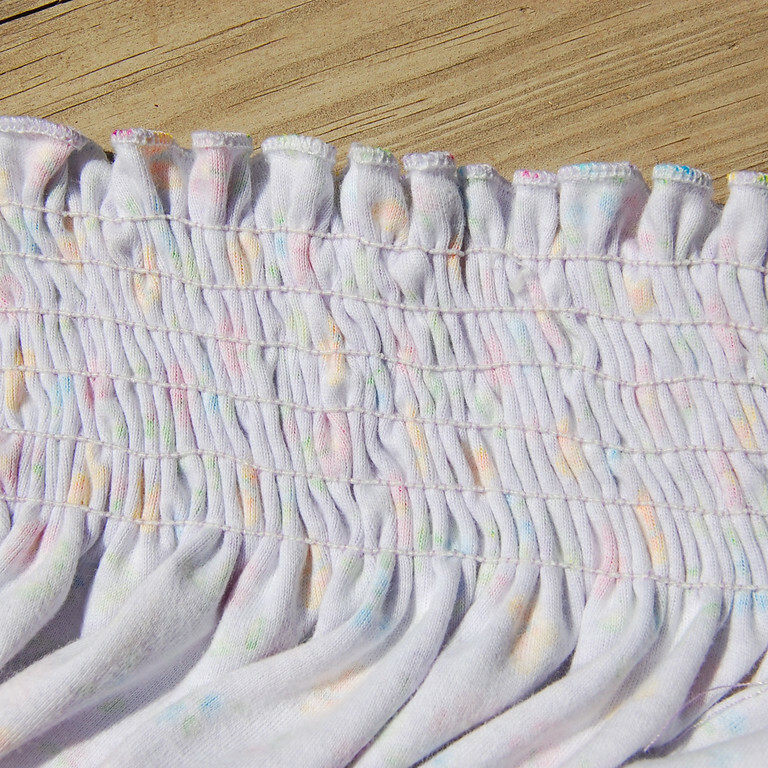 Shirring (like other ways to elasticize something) is very inexact - and different outcomes will happen for different fabrics, types of elastic thread, bobbin tension, width of original unshirred piece of fabric etc. So the most accurate way to ensure the bodice fits right, and the straps are positioned correctly, is to try them on the wearer and measure as you go. knit fabric, and knit fabric+shirring = superstretchy. much taller she will be next summer. Time it took to make: 45 minutes - 1 hour. for her dress fittings than actually sewing. Next: Armhole variation on shirred dress. So cute! But I have to ask where do you find all your knit fabrics? We have 3 stores and they only carry solid knits. 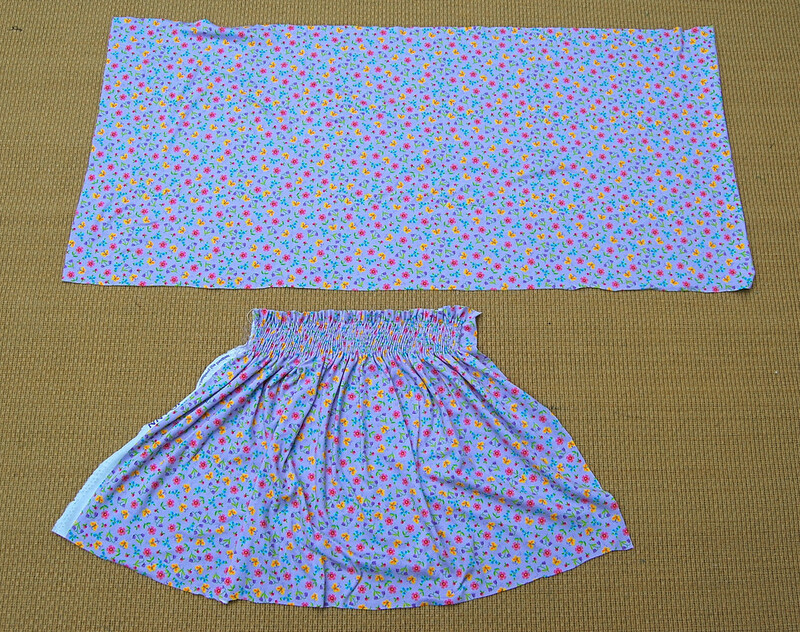 I have been wanting to try the skort and can't find a skirt fabric! Lovely dress! And the model also! I agree, it is much more economical to do the shirring yourself and it is easy. Thank you for sharing and Happy Sewing! That is SOOO cute! I'm so impressed with all the projects you manage to get out AND give us directions for. It's so inspiring! I'll be linking. Ugh, I've been meaning to try this for ages. Even bought the elastic thread. But they were out of white so I bought black. Perhaps that was my mistake -- I can't bring myself to open the package and use such darkness on a bright cheery little girls dress! I love this! I love how you cut the spaghetti straps all curvy like that. Brilliant. PS This morning I heard my daughter in the bathroom whining, "I'm stuck! I'm stuck!" She was stuck in her shirt. So, yeah, I totally get it. 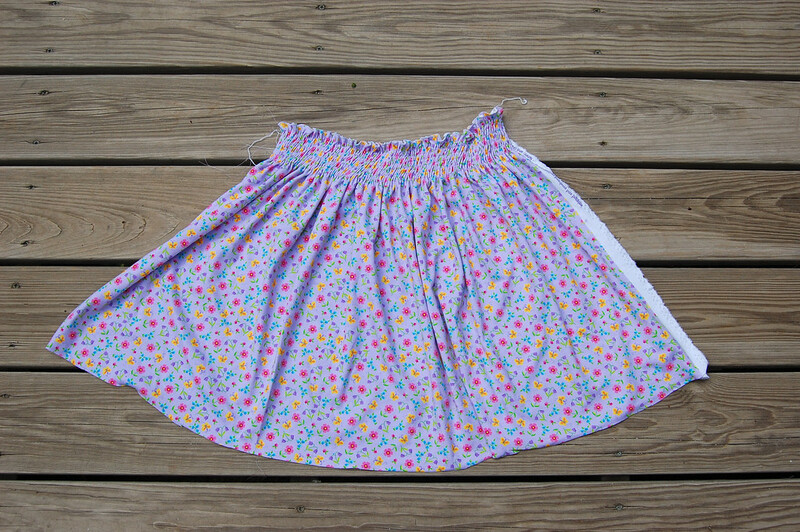 This shirred dress is very cute, it definitely makes me want to try my hand at shirring, maybe once I work up the bravery (hopefully this weekend when I'll have TWO siblings over to entertain my children and therefore very few excuses to continue to procrastinate) to try my hand at sewing diapers. I love this dress. I would like to make it for a friends daughter but I think I am doing something wrong. I am using a woven cotton fabric. Her chest is 21.5 x 2+3 =46" which is the length of the fabric. The Y come out at 20" which is the width of the fabric. Am I suppose to shirr the length of the fabric? Hi Renee, am glad you're trying this dress out. You didn't leave an email address so I'm answering your question here - I hope you'll be back to read this! Let's see how I can help..... First, some information you probably already know: any garment should be cut so that the edge of the fabric parallel to the selvedge is vertical when the garment is worn. This is because many fabrics have at least a little stretch in the perpendicular-to-the-selvedge direction. So we want this "little stretch" to be across our bodies rather than vertically. So your rectangular (before shirring) should have its longer edge (43") perpendicular to the selvedge and the shorter edge (20", plus whatever hem allowance you need) should be parallel to the selvedge. (i) you are on the right track. Yes, you should shir along the longer edge of your fabric. It sounds like yours is a typical 43-45" width fabric. If you're still not sure, pull a little along this edge you want to shir. It should be more stretchy than the other 20" edge. Not by very much, since woven cotton (like quilting cotton?) isn't very stretchy anyway. (ii) the nomenclature of fabric is very odd sometimes. The WIDTH of the fabric is the height of the bolt it comes on, which is often standard: 45", 36", sometimes 20" (like interfacing). The LENGTH of the fabric is how much we cut off to buy, like a yard or a meter. Now, if you buy a yard of 45" fabric and bring it home, it is a rectangle whose shorter side is 36" and longer side is 45". So mathematically we call the longer side its length (when it's actually the WIDTH) and we call the shorter side its width (when it's actually the LENGTH). So bottomline (if you haven't fainted from my longwindedness by now) - yes, shir the 43" edge of your rectangle. When you're done, sew it into a tube of 20.5" or 21.0"circumference (with the shirring unstretched). This is 0.5" to 1" narrower than the wearer's chest and should give a snug enough fit without suffocating her, especially after washing. Try the stretchiness out yourself by pulling on it a bit - different cottons and bobbin tensions will give a different final tautness to the shirring in the end. Good luck! This is great. It inspires me to try a shirred dress or top at some point. I also now want to get a serger because - among other things - I didn't realize it could help one make ruffled straps so easily! I'm going to have to track down some elastic thread. Do you ever sew these with non-knit fabric? Christine: My mock-up (test-run) was on some random printed cotton fabric and it worked fine. 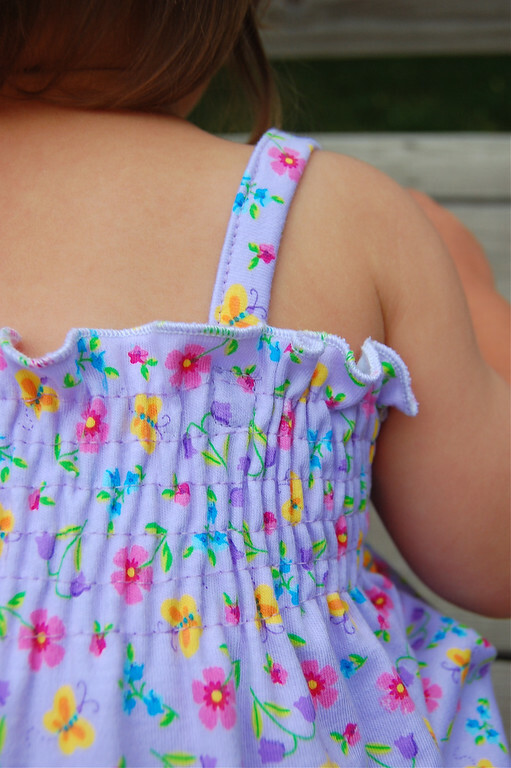 I just prefer knits for kids' summer dresses (and shorts) in general because they are so much more comfortable. Especially with all the gathers from the shirring, against their skin. Knits are so much softer. But I'm sure regular cottons will work too. I just finished two of these for my girls, ages 4.5 and 1.5. They are wearing the same size, lol. I have made them before, but I really liked your tutorial, and I hadn't thought to make them in a knit. They're so much more comfy in a knit! I found that I was disappointed with my shirring until I steamed it really well. I also used some pretty beefy knit fabric, so I think the shirring was a bit bogged down with the weight. I made one with a strap that ties behind the neck so I can tell them apart. It looks really cute, but I'll need to make it a little more snug so it doesn't droop and become quite immodest, lol. I love the rest of your blog, too - so many great ideas! You're very creative. Thank you for the tutorial. Thanks so much for sharing this awesome tutorial! Yes, I think it will work on very thin towelling fabric. 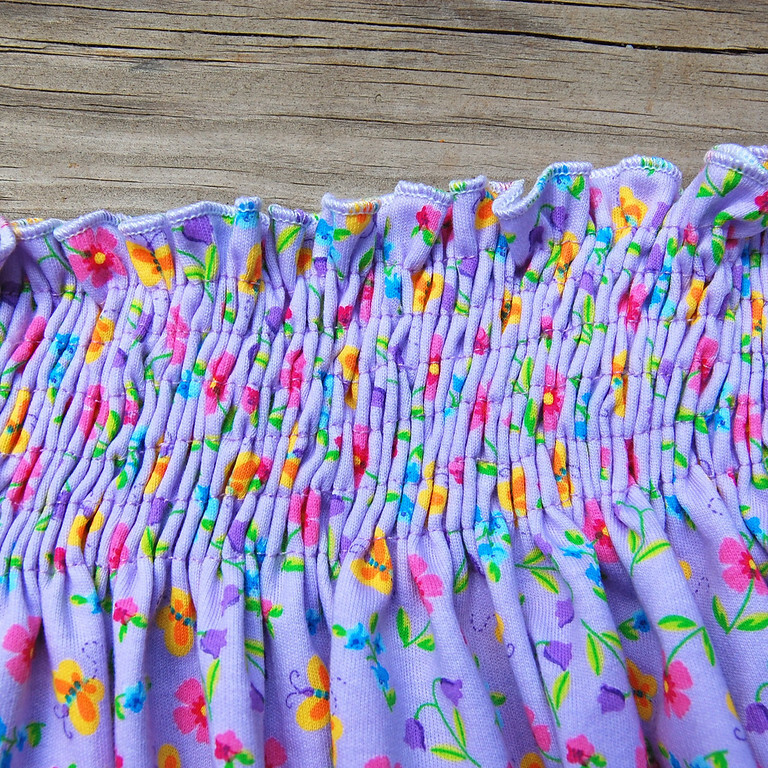 Shirring works best on thinner fabrics- with thicker terrycloth (like if you were to cut up an actual towel to turn into a dress), it would bunch up a lot and lose the stretchiness effect. Maybe parallel lines of elastic sewn behind the fabric instead of shirred elastic thread? Same effect, but stronger stretchy fibres - less likely to snap. Just wanted to say thank you so much. I just made my 2nd ever dress for my daughter following this. I made it with ribbon straps and put a ribbon on the bottom hem as well. ONe thing I will say is if you have a drop in bobbin it may not feed properly to the tensioner and must be manually fed through, ask me how I know this. It is not easy to pick out 3 rows of this stuff! Thanks, Renee, for the tip. I never thought a different bobbin feed might make a difference, but am glad you shared your experience - it might just save other folks with drop-in bobbins from a rather frustrating experience! Thanks, can you actually smock once the fabric is shirred??? But otherwise, I imagine a person could smock on top of shirring. If you do try it, let us know! I am so glad I found this tutorial! I have some shirred fabric that I am ready to make into this dress (I was going to wing it but glad to have some back-up). I was unhappy with the trim/ribbon options for straps. It never occurred to me to just use the same fabric. DUH! I am doing this one today for sure. Thanks! Oh, my goodness! This is top notch beauty! hi. Just wanted to thank you for posting this tutorial! I made one for my 3year old and she loves them so much she calls them her 'princess dresses'. The instructions were so easy to follow making them quick to make which is good as she keeps demanding more! Thank you again for sharing! you have my 3 year old a very happy girly! LiEr - all of my shirring "escaped" when I cut and serged the seam allowance. This was after sewing and resewing the side seam over the shirred portion 5 times using the smallest stitch length possible (setting "1.0"). All that shirring work, wasted. I'm devastated! (No, not really, but I am sad.) Do you have any clue about how/why my stitching over the elastic never caught ANY of it? Did I have too much tension on the elastic?